What’s not to like about Bubba Watson? He is an amazing talent on the golf course. He is a man of faith. He is a family man. He is a lefty who hits the ball over 350 yards. He likes pink. He is the type of player you just can’t help rooting for. He wanted an Upper Deck card, and we’ve delivered over and over again. And now he is the 2012 Masters Champion. It has been a lot of fun to watch Bubba get better and better since we began working with him. I personally have the feeling that “Bubba Golf,” is here to stay and we are going to see a lot more from him with regard to amazing shots and more tour victories in the future. 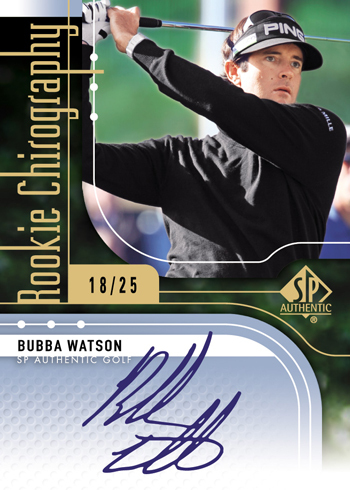 Upper Deck has produced some cards of Bubba Watson before for promotional and multi-sport set, but this July we will be releasing the first stand-alone golf set since 2005 and there will be plenty of Bubba content to go around. 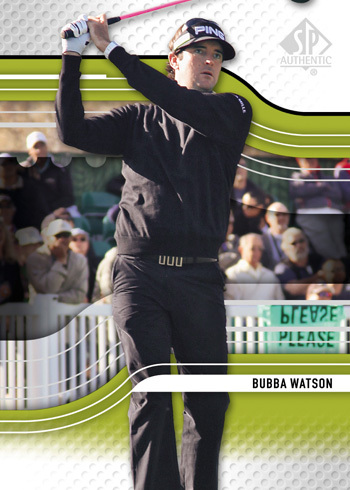 Enjoy this sneak peek at just some of the Bubba Watson cards you can find in 2012 SP Authentic Golf. This is what Bubba's base rookie card will look like. We also have autograph parallels in the works as well. This will be one of the autograph parallel cards in the set. Here is another autograph parallel card in the 2012 SP Authentic Golf set of Bubba. 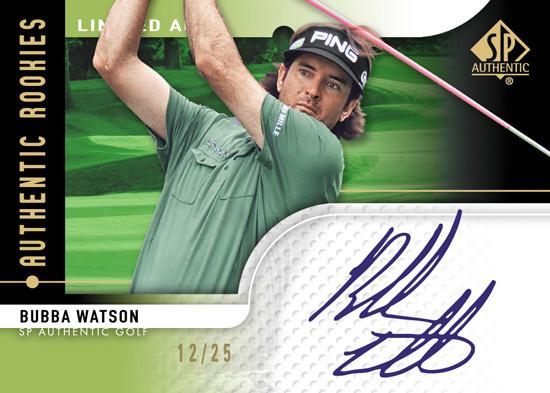 There will be a variety of topical multi-signed cards in 2012 SP Authentic Golf as well featuring Bubba Watson. This one showcases signatures from some of the longest drivers in the game. Cards depicted for demonstration purposes only. Cards and set content subject to change without further notice. wow! Can’t wait to see this stuff. Looks awesome. Glad Upper Deck brought Golf back. Chris, if you look at the 54 second mark of that video, you will see the best logo in college sports…..GO COUGS! GREAT idea to bring Golf back to UpperDeck! THANKS UD! Any chance we’ll see Rickie Fowler autographs in this?